There are at least a thousand ways to experience our island in the sun. We have around a hundred suggestions to get you started. Personalized travel, private tours, tailor-made itineraries and much more. For a simple, ready-made solution, choose one of our scheduled tours of Sicily. You'll find dozens of start-dates—almost every week of 2017—more than any other company in the world. A few of the most popular ideas are presented on this page. You imagine it, we plan it. It's that simple. Because our Sicily travel experts are actually based in Sicily, you're dealing directly with the specialists planning and overseeing your Sicilian holiday rather than a travel agent who must rely on an "outsourced" consultant. Contact us if you'd like to arrange something that you don't see here. About Us: We're the kind of Sicily-based company that your local travel agent uses! Based in Palermo (Sicily's largest city), Tradizione Turismo Chat & Tour (whose services are marketed under the names Best of Sicily and Sicily Concierge) is a licensed tour operator and travel services company associated with the IATA and the American Society of Travel Agents. Most of the services mentioned on this page are provided directly by Tradizione Turismo; some (specifically those presented on Best of Sicily's Bed & Breakfast and Hotel pages) are offered by other firms and this is clearly indicated. Visit our main tours page for terms and purchase conditions, as well as faqs, regarding our tours and excursions. IMPORTANT: A num­ber of in­depen­dent "guides" in Si­cily offer such services as week-long tours and one-day ex­cur­sions (driv­ing you from place to place). Un­fortunate­ly, most of those found on the inter­net are not li­censed as tour guides, tour oper­ators or taxi driv­ers. This means that they probab­ly lack ac­cident in­surance that covers a client who (for ex­ample) in­curs an in­jury while walk­ing from the guide's parked car to an archeo­logi­cal site, such as the temples at Agri­gento and Se­gesta. Worse yet, some of these "guides" may de­ceive you into believ­ing that they are li­censed when they are not. In Italian law, on­ly a proper­ly li­censed com­pany qual­i­fies for the in­sur­ance de­scribed. In Italy the tour­ism/trav­el in­dustry is high­ly reg­u­lat­ed for your pro­tec­tion. Even if you don't plan your visit with us, please be careful about the person or firm you do choose. 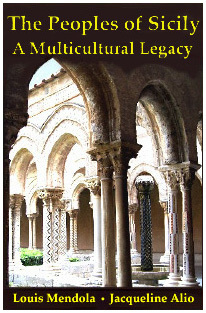 The Peoples of Sicily: A Multi­cultural Legacy. Full of Greeks, Arabs, Normans, Germans and Jews, the most signif­icant general history of Sicily ever pub­lished is about much more than an island in the sun. Here is a landmark work. Can the eclectic medieval experience of the world's most conquered island be a lesson for our times? Meet the peoples! (368 pages on acid-free paper) Read more. 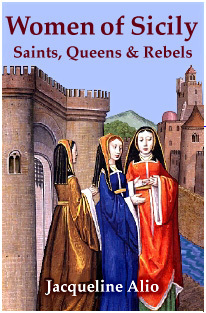 Women of Sicily: Saints, Queens & Rebels. Meet a time­less sister­hood of pious Roman maidens, stead­fast Sicilian queens, and a Jewish mother who faced the horrors of the Inquisi­tion. Find an island's feminine soul in the first book about Sicily's historical women written in English by a Sicilian woman in Sicily. (224 pages on acid-free paper) Read more. The Kingdom of Sicily 1130-1860. 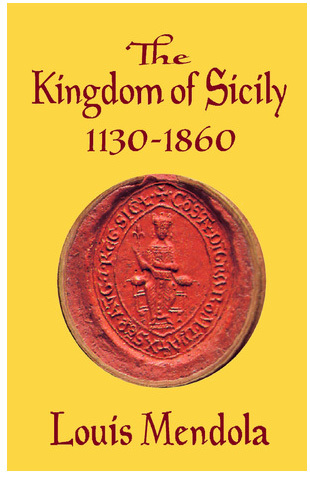 The first book covering the history of the Kingdom of Sicily from its beginning under the Normans until the unification of Italy. An amazing journey across time with one of Sicily's leading historians, who explains how we are all Sicilians and why it matters. (440 pages on acid-free paper) Read more.